peptic esophagitis (reflux esophagitis) a chronic, potentially life-threatening disease manifested by the various sequelae associated with reflux of the stomach and duodenal contents into the esophagus (gastroesophageal reflux); it is often accompanied by heartburn and regurgitation, although not all patients with those symptoms have pathologic changes. It may occur as a primary condition or be associated with other diseases such as hiatal hernia. inflammation of the lower esophagus from regurgitation of acid gastric contents, usually due to malfunction of the lower esophageal sphincter; symptoms include substernal pain, "heartburn," and regurgitation of acid juice. esophageal irritation and inflammation that result from reflux of the stomach contents into the esophagus. See also gastroesophageal reflux. Gastroesophageal reflux disease, see there. Inflammation of the lower esophagus resulting from regurgitation of acid gastric contents, usually due to malfunction of the lower esophageal sphincter; symptoms include substernal pain, heartburn, and regurgitation of acid juice. Inflammation of the lower esophagus caused by the backflow of stomach contents. Inflammation of lower esophagus due to regurgitation of acid gastric contents, usually due to malfunction of lower esophageal sphincter; symptoms include substernal pain, "heartburn," and regurgitation of acid. inflammation of the esophagus. Primary esophagitis, caused by physical irritants, causes spasm and obstruction, with pain on swallowing or palpation, profuse salivation, regurgitation of slimy, blood-stained saliva and feed, and may lead to stricture formation. Esophagitis also occurs commonly in ruminants as a secondary lesion in diseases characterized by erosive and vesicular lesions of the alimentary tract. 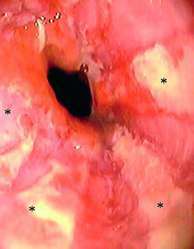 Gastric reflux, invasion of the esophageal wall by Hypoderma spp., thallotoxicosis and paraquat poisoning are other causes. inflammation of the esophagus due to a reflux of acid and pepsin from the stomach; occurs particularly in dogs and cats while under general anesthesia. Called also reflux esophagitis. The above approval will add a treatment option for patients with reflux esophagitis who had inadequate response to the existing treatment by proton pump inhibitors, and through this, the two companies aim to further contribute to the treatment of patients with acid-related diseases. Just Published: "Reflux Esophagitis (Gastroesophageal Reflux Disease) - Pipeline Review, H2 2014"
Helicobacter pylori serology inversely correlated with the risk and severity of reflux esophagitis in Helicobacter pylori endemic area: a matched case-control study of 5 616 health check-up Koreans. Modern pictures of pathogenesis, diagnostics and treatment of reflux esophagitis," Clinic. Increased acid and bile reflux in Barrett's esophagus compared to reflux esophagitis, and effect of proton pump inhibitor therapy. It is possible that severe reflux esophagitis with ulceration can cause upper abdominal pain. Dr Souza, another of the study's authors, commented that "in animal models of reflux esophagitis designed to mimic the human disease, researchers hadn't looked at the early events in the development of esophageal injury. Reflux esophagitis in the pathogenesis of paroxysmal atrial fibrillation: results of a pilot study. 2) If left untreated, reflux esophagitis may lead to peptic esophageal stricture in 4 to 23% of these patients. Gobezie diagnosed the patient with questionable reflux esophagitis, peptic ulcer disease, exogenous morbid obesity, chronic obstructive pulmonary disease, and degenerative osteoarthritis.